National Proposal Day Contest Winners - Shane Co.
Congratulations to our National Proposal Day Contest winners! 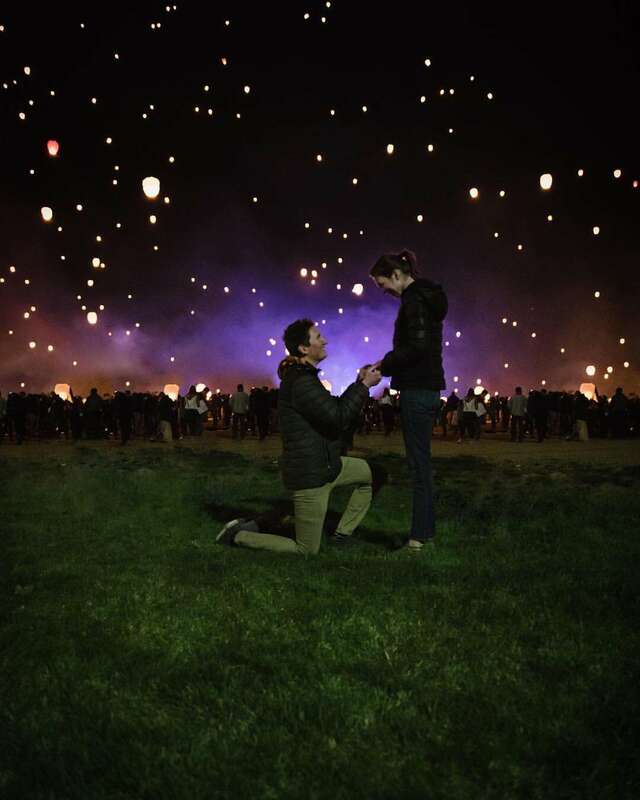 From scuba diving to lantern lighting, our contest winners have the most romantic proposal stories that you have to read to believe. 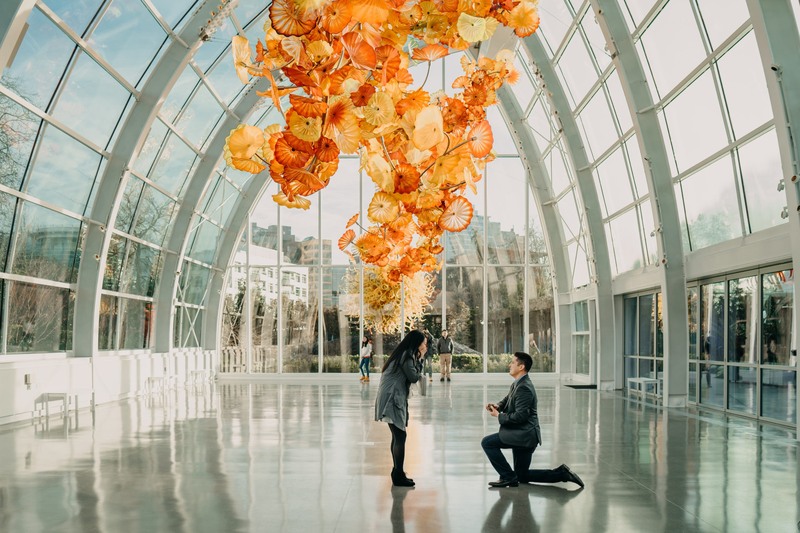 “Aaron proposed to me on December 12, 2017, at the Dale Chihuly art museum. We dated long-distance for two years before making Seattle our home. I had been wanting to visit Chihuly’s exhibit for a while because of his extravagant artwork. A few weeks before the proposal, Aaron forwarded me an email from his company stating that they had extra tickets for the exhibit and I was thrilled. Little did I know that the email was fake and he had purchased the tickets himself and had his coworker write an official email to offer him the tickets. He had gone through the exhibit to find the perfect spot, had his cousin take me to get our nails done, hired an amazing professional photographer, Sasha Reiko Photography, and surprised me with the most beautiful proposal and the most gorgeous emerald cut engagement ring. Thank you, Shane Co., for making this day so special!” — Melissa M.
“I had planned a date to the lantern festival and was extremely excited! We got all our supplies and picked a spot to sit down. They gave us a lantern, s’mores stuff, a marker and a lighter. Gavin had the fun idea to sit back to back to draw on our lanterns. I got done way quicker than he did and had to wait and wait. It was finally time for everyone to light their lanterns and he was still doodling, telling me not to look. I was getting anxious because I wanted to light my lantern with the other thousands of people there! Gavin helped me light mine and we sent it up into the air. Then it was time to light his and as it was filling up with hot air, getting ready to lift into the sky, I saw my name written on it with ‘Will you marry me?’ I was so happy as we sent it up into the air and a super nice lady that happened to have her nice camera took some pictures of us. They’re the best I could have ever asked for, which is crazy since it wasn’t even really planned for her to take our pictures! 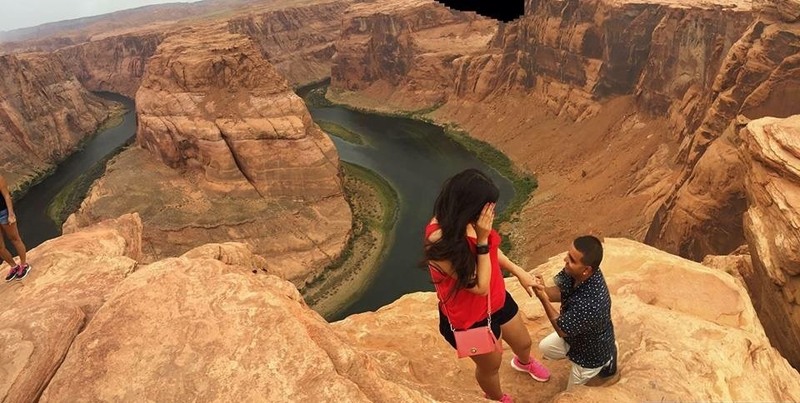 Everything turned out magical.” — Hanna N.
“My boyfriend and all of his friends planned a trip to Las Vegas. So we flew down to Vegas but then they decided to drive down to Arizona. We went somewhere I have always wanted to go: Antelope Canyon and the Horseshoe Bend. 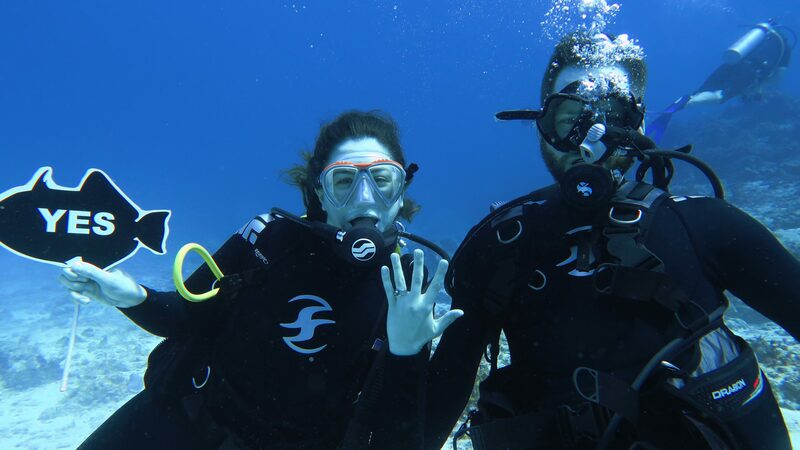 He said let’s take a picture, so I walked over to a spot and when I turned around everyone was out of the way and he was on his knee.” — Eva H.
“Mikkel and I traveled to Cozumel for a scuba diving vacation. We scheduled a handful of dives around the beautiful local reef, and on the second dive of the trip we ‘happened upon’ a glistening shell with a pearl inside. When I realized the pearl was attached to a ring, he unfurled a sign that read ‘Will you marry me?’ and offered me the choice between a ‘yes’ sign and a ‘no’ sign. 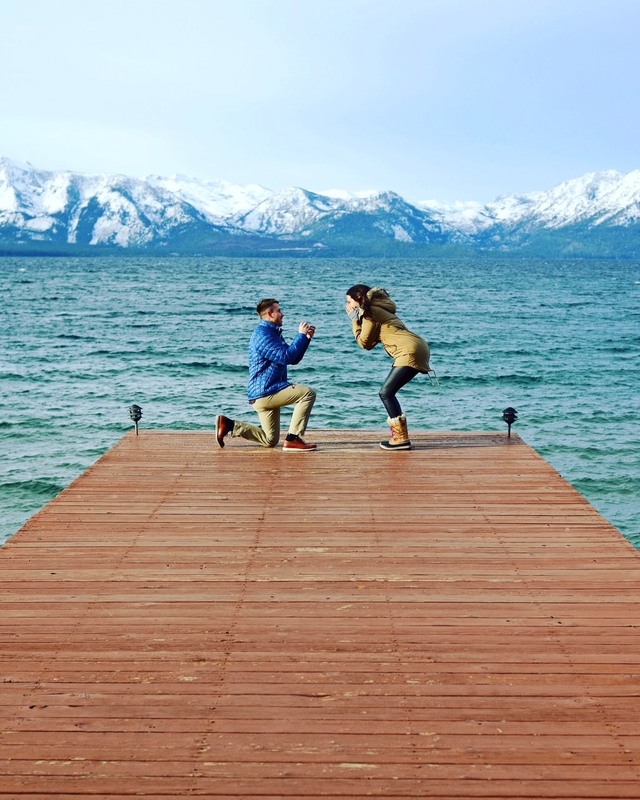 Of course I said yes, and now we’re searching together for the perfect diamond engagement ring!” — Brynnan F.
“We were heading up to Lake Tahoe for a little weekend getaway late on a Friday evening. Tahoe was the place that we fell in love, started dating and soon to be where my best friend asked me to be his human forever. 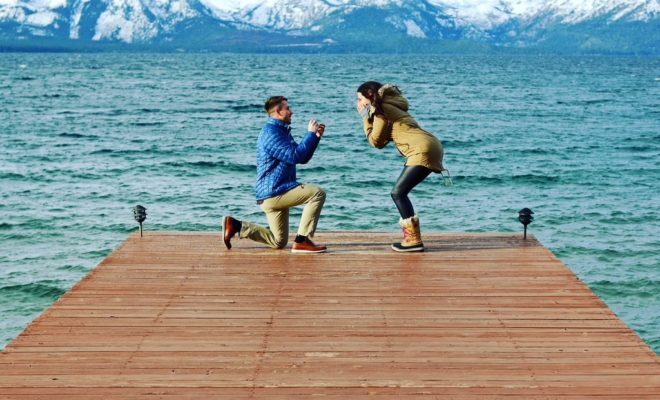 We frequently went up to Tahoe for little getaways so I really had NO IDEA that he was about to ask me to marry him.” — Lexy A.